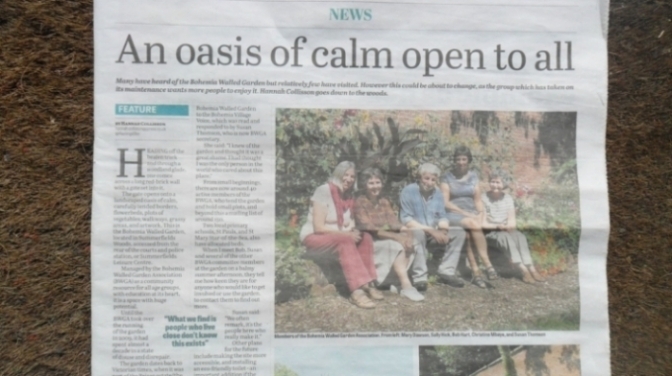 Hastings Observer Fri 16th August 2013 - An Oasis of calm open to all. An Oasis of calm open to all by Hannah Collison. HEADING off the beaten track and through a woodland glade, one comes across a long red-brick wall with a gate set into it. The gate opens onto a landscaped oasis of calm, carefully tended borders, flowerbeds, plots of vegetables, walkways, grassy areas, and artwork. This is the Bohemia Walled Garden, located in Summerfields Woods, accessed from the rear of the courts and police station, or Summerfields Leisure Centre. Managed by the Bohemia Walled Garden Association (BWGA) as a community resource for all age groups, with education at its heart, it is a space with huge potential. Until the BWGA took over the running of the garden in 2009, it had spent almost a decade in a state of disuse and disrepair. The garden dates back to Victorian times, when it was part of the Brisco estate (the house was demolished in the 1970s), and has changed uses several times since, more recently being used by the probation service as a space to grow vegetables. Now the garden is open to the public every Sunday from 10am to noon, and there is a burgeoning programme of events, ranging from workshops to exhibitions, small concerts and film screenings. It is a space transformed, which despite being surrounded by dense woodland, looks as if it is naturally occurring. However this belies the effort that goes into the garden’s upkeep by the dedicated team of volunteers. BWGA chairman Bob Hart said: “What we find is people who live very close don’t know this exists. The association was formed after Bob submitted a letter on the plight of the Bohemia Walled Garden to the Bohemia Village Voice, which was read and responded to by Susan Thomson, who is now BWGA secretary. From small beginnings, there are now around 40 active members of the BWGA, who tend the garden and hold small plots, and beyond this a mailing list of around 150. Two local primary schools, St Pauls, and St Mary Star-of-the-Sea, also have allocated beds. When I meet Bob, Susan and several of the other BWGA committee members at the garden on a balmy summer afternoon, they tell me how keen they are for anyone who would like to get involved or use the garden, to contact them to find out more. Other plans for the future include making the site more accessible, and installing an eco-friendly toilet - an important addition if the programme of events is to expand. In September BWGA is to launch a five-year fundraising appeal to raise the £70,000 to repair one of the four garden walls, which it is believed was destroyed in the Great Storm of 1987. A tall order perhaps, but making people aware of what is on their doorstep can only be a massive step in the right direction. On September 15 2013 , the garden will be open to the public from 10am to 1pm for a special event as part of the Heritage Open Days programme. There will be talks from a local moth expert, bee keepers and a Sussex Wildlife Trust officer on gardening for wildlife, as well as refreshments and an art activity for children.